Rosacea is a long term irritated skin and eye inflammation with symptons presented on the cheeks, nose, chin, forehead, and eyes and eye lids. The erythema (redness) of rosacea is caused by inflammation of the skin by various 'triggers' such as harsh soaps, rosacea treatments that are too aggressive for the skin, sun damage, and many acidic foods and drinks that are well known individually to cause or trigger various rosacea symptoms. These irritated skin areas resultantly have increased prominence of the blood vessels or vascularity and swelling of the skin tissue known as hyperplasia. Also co-occurring skin diseases are acne which 82 % of rosacea patients have and with 35 % of rosacea patients also having seborrheic dermatitis. There is very little correct knowledge of the cause of this disease nor what to do about it. Research indicates that rosacea results from an overly acidic body and skin with the condition being called, "metabolic acidosis". The pH scale (potential of hydrogen, ranges from 0 to 14, with 7 being neutral. As you think of your past rosacea history, you will see that all the rosacea triggers have come from acidic triggers regardless of whether they are foods, drinks, stress, or lack of breath due to not enough oxygen (oxygen is an alkaline) and inability to exhaust enough carbon dioxide (carbon dioxide is acidic), or lactic acid given off when we exercise or work. We all know that if we hold our breath for 30 seconds or 60 seconds, our face turns pink or red. And when you look at the color of your tongue when your race is red, you will more easily realize that "Rosacea is more than a red face" as it affects all internal organs regardless of whether we can see them or not. We all know, but hardly think or rarely realize that as we become so busy in our day, that one of the causes of rosacea is a build up of carbon dioxide which is an 'acid gas' and we have a shortage of alkaline oxygen. Very similarly, when we exercise too long and become aerobic, we have a build up of Lactic Acid which is a body waste of muscle and fat tissue (and obviously acidic). Likewise, those with rosacea need to be very concerned about the build up of acids in the blood stream due to the foods and beverages that we consume. Our triggers such as alcohol, coffee, pizza, candy/cookies, various medications, etc. which all have a pH below 7.0 are termed acidic. Our objective therefore should be to balance, buffer or neutralize the acids with alkaline. The effects of metabolic acidosis or 'triggers' of rosacea are presented on the skin and eyes as both are most visible. However, the same 'cause' irritates other organs such as the brain as we become more stressed and think of rosacea as as stress disease while stress is only one symptom of 'metabolic acidosis'. The effects are not as visible in our 20's and early 30's but affect our entire body from the mental functions such as relaxation, short and long term memory, priorities and even to our personalities and relationships with others as we find ourselves being 'short, abrupt, not following through as we should and with the resulting need to apologize more for not being able to see the other person's point of view. Likewise as our gastric styem becomes more acidic, we began to notice more burping, flatulates (gas), but later in life the symptoms of metabolic acidosis are much more serious with diabetes, bone loss and density, cancer and stokes. Yes, Rosacea is more than a red face" to gain our attention more to the 'cause' or efects of metabolic acidosis. Rosacea is 'not' a hereditary condition as many medical doctors believe as hereditary denotes a genetic condition that is inherited. Yes, rosacea is a chronic (long term) skin disorder that most often affects the nose, cheeks, and forehead, but you will hopefully have noticed that these areas have the largest supply of blood arteries and veins. Thus, they have the largest accumulations of acids over the years. If it were an inherited skin disorder, rosacea would start from a very early age of 2 weeks or several years after birth. Rosacea sufferers accumulate rosacea symptoms from the triggers of foods, drinks, sun exposure, poor skin products and very poor medical treatment that causes the condition to be long term and thus a migration from one dermatologist to another and from one or two rosacea medications to several other rosacea medications. "While the incidence of rosacea appears to be rising sharply as more people enter the most susceptible age, many mistakenly think it's just a complexion problem that will go away by itself -- but in fact it usually keeps growing worse if left unchecked," said Dr. Joseph Bikowski, assistant clinical professor of dermatology at the University of Pittsburgh. "Of greatest concern is that only a small percentage of rosacea sufferers realize that medical help is available from dermatologists to halt its progression and reverse its symptoms." The desire exists today to find new and innovative ways to treat rosacea and other skin conditions naturally without the use of drugs, lasers and sometimes harmful chemicals. This is not an unrealistic rosacea treatment goal. It is possible to live with, control and manage rosacea safely and effectively. Rosacea is 'triggered' by sunlight, physical exercise, mental stress, sinus & allergy conditions, hot liquids, spicy foods, extremes in temperature, and alcohol that is either topically applied or orally consumed (Drs. McKoewn, Wilkin, Wilkin, Wilkin). A point of interest is that all of these triggers are 'acidic on the pH scale' thus causing irritation as the body should be alkaline. It is important to note that what aggravates one person's rosacea may have no effect on another person's rosacea (Dr. Wilkin). Weather extremes such as dryness and sunlight affect rosacea by causing more skin irritation. Groups of tiny microvessels (arterioles, capillaries, and venules) close to the surface of the skin become dilated, resulting in blotchy red areas with small papules (a small, red solid elevated inflammatory skin lesion without pus, that is minor when the size is of a small measles lesion, moderate when about the size of a pencil eraser, and severe when the papule is the size of a small currency coin or the tip of the little finger) and pustules (pus-filled inflammatory bumps). While the redness of rosacea temporarily improves, eventually it may become permanent as most rosacea sufferers do not make enough improvements to repair the skin before it becomes too sensitive for treatment or to touch after the skin tissue swells and thickens due to the inflammation caused by acid food and drink ingestion, sunlight, overly aggressive rosacea treatment, etc. Most rosacea suffers have gained much knowledge in their battle with the disease, but unfortunately, most of the gained knowledge has not been helpful in solving the problem. Sadly most information available is about rosacea treatments that do not work, which results in years of frustration for the rosacea sufferer as usually they continue seeking information and migrate from dermatologist to dermatologist for years in their search for the best rosacea treatment answer. Knowledge of the symptoms does not solve the 'cause or etiology' of rosacea. After understanding the 'cause' very well, then the rosacea treatment can be used. The classic rosacea symptoms are patchy flushing (redness) and inflammation, particularly on the cheeks, nose, forehead, and around the mouth. Rosacea typically appears between the ages of 30 and 50 and affects more women than men. 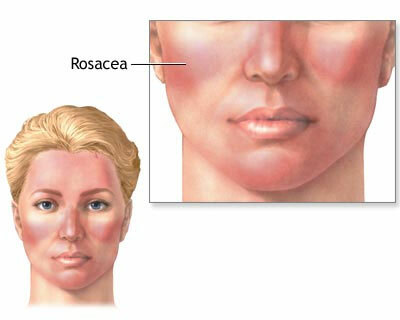 As the rosacea sufferer becomes older, acid accumulates within the body organs, bones, in the face and in the brain. We all have known for years that the largest blood supply is to the head with the brain and the face always having a larger blood supply. As symptoms emerge slowly, rosacea may initially be mistaken for sunburn, leading to a delay in proper rosacea treatment. Rosacea treatment delayed is 'rosacea treatment denied'. Ocular Rosacea can also cause a persistent burning and feeling of grittiness in the eyes or inflamed and swollen eyelids with small inflamed bumps. The eyes may become bloodshot and eye lashes sometimes fall out (Dr. Thiboutot). The rosacea ophthalmic signs are exceedingly variable, including blepharitis, conjunctivitis, iritis, iridocyclitis, hypopyoniritis, and even keratitis. The rosacea ophthalmic complications are independent of the severity of facial rosacea. Rosacea keratitis has an unfavorable prognosis, and in extreme cases can lead to corneal opacity with blindness. The most frequent signs of ocular rosacea, which may never progress, are chronically inflamed margins of the eyelids with scales and crusts, quite similar to seborrheic dermatitis, with which it is often confused. A rosacea sufferer needs to consider how their eyes react to bright sunlight as the eyes are very sensitive to sunlight. Treating ocular rosacea can be difficult. A dermatologist treats the direct impact of rosacea on the skin but is not trained in the treatment of rosacea involving the eyes. An ophthalmologist specializes in the treatment of eye conditions does not always link this to a co-coordinating treatment for rosacea manifestations of the skin. The worst treatment by ophthalmologist is the use of eye droplets that are 1/3 steroid and 2/3 antibiotics. It does have a temporary effect on the redness but a most negative adverse reaction of the steroid/antibiotic ocular treatment is the "inability to see with clarity" as the steroids take effect. Ocular rosacea combined with Keratitis could lead to blindness. Medical doctors and researchers have found Rosacea-Ltd III to be the best solution with 100% accuracy as you will learn below. What is Rosacea of the skin? It is easy to understand the cause or etiology of rosacea. Many rosacea sufferers and researchers easily summarized the triggers and then have learned the cause in the development and can now more easily understand the cure. Rosacea is a disorder of the blood vessels that causes them to swell, leading to flushing. It is most often caused by the acidic foods and drinks consumed by the rosacea sufferer as most have known the 'triggers' that cause the flushing and redness such as alcohol, coffee, exercise, stress, etc. that are all acidic in nature. The intake of foods and drinks needs to be more alkaline to 'offset' or neutralize or buffer the acids to return the body to a more alkaline condition. A secondary cause is not enough facial exercise to help the flow of arterial blood through the facial area. Rosacea seems to affect fair-skinned people more often, though it can affect any skin type. Often several people in a family have the condition, thus it is believed to be at least partly genetic. The disorder may be somewhat more common in women, but is often more severe in men. In some cases, it may be associated with migraine headache, other skin disorders, and certain eye disorders, including blepharitis and keretitis. The following other conditions can have symptoms similar to rosacea: Acne, psoriasis, eczema, and atopic dermatitis. This has caused some confusion to both dermatologists and patients. The International Rosacea Foundation is a non-profit organization whose primary mission is to make available easy readable rosacea symptom and the best rosacea treatment information on one web site. This information has been chosen from medical books, medical journal articles, and on the web and with available credits to those rosacea writers. Information provided by the International Rosacea Foundation about products and the best rosacea treatments, medical conditions, and symptoms, has been obtained from the manufacturer's prescription product information inserts and from their web sites sponsoring these products. Rosacea conditions and treatments may vary from one patient to another, and treatment must be tailored for each individual case. Therefore, we do not answer individual questions about your skin condition. The secondary mission is to provide research for the best rosacea treatments for rosacea sufferers. The International Rosacea Foundation provides the most informed and accurate rosacea treatment information that is easy to read and concise with the rosacea treatment information from manufacturer's prescription medication labels, the latest rosacea research studies and from the newest Rosacea Teratology textbooks. Some feel that the the many skin conditions with similar symptoms such as acne, seborrheic dermatitis, eczema, or lupus can make the diagnosis difficult. The primary problem is that medications used in the treatment of acne can be too harsh or aggressive leading to the onset of rosacea or acne rosacea. Aggressive acne treatments to reduce oiliness of the skin can result in the flaking associated with seborrheic dermatitis. The butterfly rash of lupus can lead to a mis-diagnosis of rosacea. Within this site you will learn the difference between rosacea, eczema, acne, lupus and psoriasis. Very often these skin conditions co-exist making successful rosacea treatment a very difficult endeavor. Rosacea is a long term irritated skin and eye inflammation with symptons presented on the cheeks, nose, chin, forehead, and eyes and eye lids.